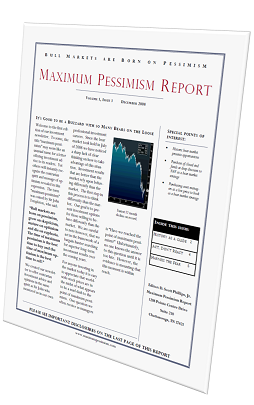 We publish a free periodic investment commentary titled "The Maximum Pessimism Report" to share with the public via email. If you would like to join our subscriber list, please complete the form below and press the submit button. We do not share our subscriber list with anyone. We respect your privacy. We will not bother you. Our only request is that if you enjoy our commentaries, please share them with others. Thank you! We appreciate your interest in our firm and commentary. Please feel free to send us questions or comments regarding our commentary to info@templetonandphillips.com. Templeton & Phillips Capital Management, LLC is not affiliated with Franklin Templeton Investments or any of its affiliated companies, including the Templeton Funds.